Are you tired of the generic off-the-rack suits that are just never what you’re looking for? Or maybe you have a specific suit in mind and it turns out that somebody got the last one? Well at R.W. Furr Clothiers, you never have to worry about that again! Rex’s custom sports coats in Dallas, TX offer an extensive selection of the finest fabrics in the world! Rex has set the standard for quality garments and developing “winning” wardrobes for men of rank and responsibility. We recognize the difference of every office environment, so we apply the dress criteria that you set out. Using only the finest fabrics in a wide variety of shades, we can create the perfect sports coat and slacks combination to fit your body and occasion.We have a wide variety and selection of custom sports coats in Dallas, TX to fit any occasion! No matter where you are going, we can help you arrive in style and in control. Every man has something important to sell: himself. Nevertheless, only the top 10% take full advantage of the persuasive power of clothing. The most powerful business tool you can utilize is not measured in gigabytes or horsepower; it is simply understanding the edge that comes from adorning oneself with discernment. From the boardroom to the courtroom, R.W. Furr Clothiers takes you to that higher level with our custom sports coats in Dallas, TX. Men usually think that when they step up in clothing, they have to stand out, which is never the goal. What we do at R.W. 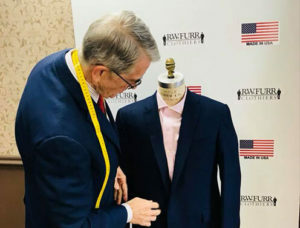 Furr Clothiers is changing the way you look and present you with our clothing but in a very modest way so that people have a general impression that you are more competent. Get your custom sports coats in Dallas, TX with us to give you that great first impression!